I can't believe we're heading into the last week of June already and it's raining here so it doesn't even feel like it today, but we're supposed to be back to normal or even hotter by the end of the week. We need the rain so I'm fine with it as long as it's during the week and not on the weekend. Of course it was another busy week with lot's of shuttling the kids around--it never ends and my gas bill is killing me, but the kids are having fun so that's what counts, right? Since Tyler and I were not home on Sunday for Father's Day we decided to celebrate today by taking John out to dinner at Red Lobster. It actually worked out nicely because the kids didn't have swim practice today, and we didn't have to fight the usual Father's Day crowds. I'm playing laundry catch up and having to slowly space it out through the week so my couch has become a sorting and folding station. 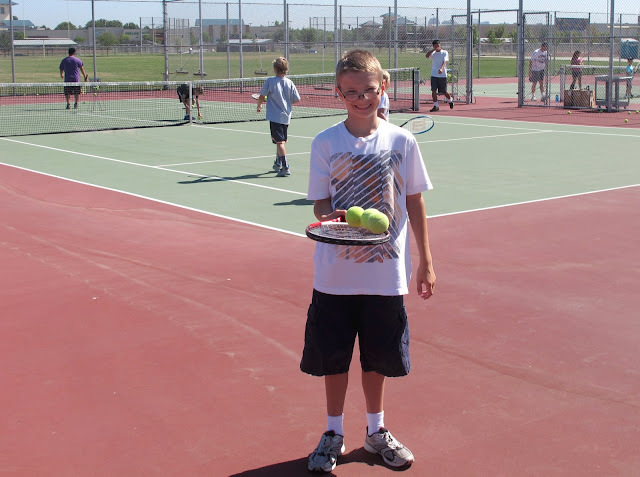 The boys started summer camp and Justin is trying the Sports Camp this year because it is in the same complex as his tennis lessons so I don't have to figure out how to get him from point A to point B while I'm at work in a completely different town. So far so good! John is out of town on business again which means the boys have a long wait at swim practice. Justin is waiting for Brandon's age group to finish so he can swim with his group next and then Brandon will play the waiting game. It makes for a LONG afternoon and it's very hot out, but we found a nice shady spot to chill. Brandon loves helping walk the dog in the evenings and he's so proud that he's finally big enough to be the one to hold the leash. It makes him so happy to be able to do this, and he looks forward to the day when he can take her out on his very own. They weigh about the same right now so I won't be ready for his solo flight until he's got some more pounds on her. Let's go West Sac! We're back in Clovis for the water polo Jr Olympic trials. It was a very long, hot and exhausting day. Done! We just finished day two of the water polo tournament and are so ready to head home. Sadly Tyler's 16&under team did not qualify for Jr Olympics even though they played their hearts out and did us proud, but the 18&under team qualified so we're all happy that at least one team will go to represent our West Sac club. It's the first year any of our boys have made it to Jr Olympics so the coach is supper happy, and next year will be the year we send both teams! So much for another week. Check back next Tuesday for more crazy fun. Tuesday again, already? I have a feeling I'm going to blink and summer will be over. 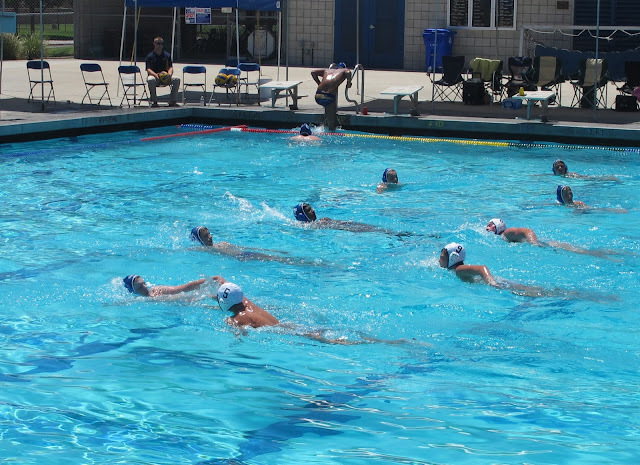 I spent the weekend in Clovis with Tyler at a water polo tournament and will be doing the same thing again come Friday. Now to figure out how to get everything I usually do on the weekends done during the week with work and kid shuttle responsibilities. I need a clone and quick! We spent all day driving home from our short trip to LA. It's a pretty boring drive with nothing much to see which makes it feel all the longer. I can't wait to get home and sleep in my own bed tonight. I'll be spending way too much time on the road this summer. We sure missed the pets while we were away. They were both overly clingy today and so happy to have us home where we belong. Justin started tennis lessons and really enjoys it. I'm hoping it's a sport he continues to love and can play once he gets in high school. He's working with the high school coach now and really likes him. It's not summer without a little watermelon. We picked one up at the store this morning and then cut into it for lunch. I took the boys for an outing to the bookstore so they could stock up on some summer reading. Tyler and I drove to Clovis, near Fresno, for a water polo tournament. We had to leave at 4:45 am to make the first game at 8:15. He's number 5 right up front. 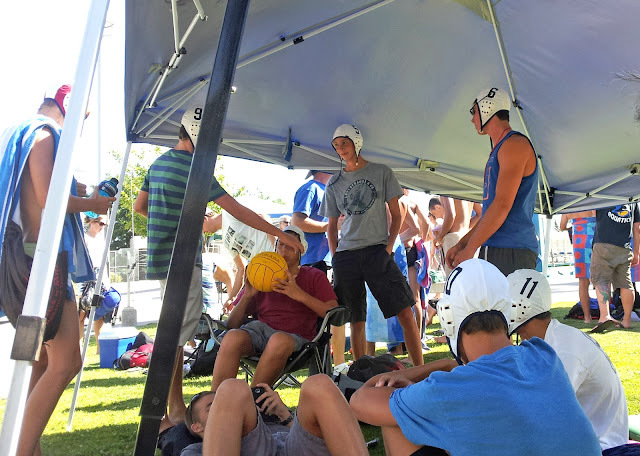 Day two of the water polo tournament brings a lot of waiting. I'm not sure exactly why they all decided to put their caps on at this point before dressing down. It's so funny to see them just hanging out like that. Crazy kids! Unfortunately we did not get home until after 9 pm and could not be with John on Father's day. We'll have to make it up to him later. That wraps up another week--my last days of vacation and now back to work. Yep, I'll blink and summer will be over. Hope to see you next Tuesday before that really happens. Better late than never! We just got back from our LA trip last night and all my pictures from last week were still on my camera so I've been editing pictures and slowly working on this blog post today in between loads of vacation laundry, grocery shopping, and taxiing the kids to and fro. It was a quick trip, and one more day would have been nice, but there is too much happening at home to be out of town that long. I'm just glad we got a trip in when we did because sporting events kind of take over the rest of our summer. Thankfully I have the rest of the week off to help the boys transition to their new schedule and enjoy a little more time with them before things really ramp up. This morning was Justin's awards assembly and he did great! He's in his first year of middle school and things finally fell into place and clicked for him in the second semester. It's so nice to see him rewarded for all his hard work. This weekend I helped Brandon make a garden stone for his teacher as an end of year gift. We broke it out of the mold and cleaned it up today so it's all pretty and ready for the last day of school tomorrow! School is out for the year, and it's time to start our summer with a road trip to LA! We didn't waste any time heading out--school ended at 12:45 and we were on the road by 2pm. The kids are having a blast at Universal Studios in Hollywood. Transformers 3D was the first ride of the day. We traveled with the Wong family and had fun exploring Legoland together. The boys really enjoyed having other kids on vacation. See how they're wearing sweatshirts? Funny thing about the weather is that it was really cool (high's in the 70's) and cloudy, but up north, back at home, they were having a heatwave with highs in the 100's. Sorry we missed that! Time for a nice adult dinner and drinks after a long day at the San Diego Zoo Safari Park and an indoor go-kart race track. It was the perfect way to spend the last night of our trip. Wait! One more--an early monthly photo. We were able to get a few family photos on our trip which is great so I chose one for this month's shot. It was a wonderful trip to help us all reconnect. It seems like as the boys get older they spend more time doing their individual stuff and less time at home so we needed this to help remind everyone that we still all belong together and can have a great time as a family. OK--now that's all. Thanks again for stopping by and hope to see you next week. Happy Tuesday! It's the last week of school here and then we are leaving for a small vacation. Southern California here we come! Last week was all about kids and last minute school stuff. I'm so ready for a break. Three more days until freedom :0) Luckily we'll be leaving here during a heat wave and traveling to much cooler temps down south. Go figure! We're home for Memorial Day and John is making us pulled pork sandwiches for dinner. He slow cooked the meat on the grill all day yesterday and today we get to eat the yummy goodness. Justin's 6th grade class went on a field trip to Mercer Caverns and I tagged along to help. It was a great trip with a great class. I'm eating a picnic lunch with Brandon as he shares his 3rd grade writing pieces with me at the school's Author Day. I'm back at the school again for 3rd grade awards. Brandon is was so proud to receive his math medal for passing his multiplication test and then he also got an award for academic excellence and perfect attendance. Smart cookie! Justin is waiting for his turn at swim practice. He usually waits at home and has John bring him later, but John is here helping set up for the swim meet tomorrow. It's June 1st! Tyler is sporting some post-meet, swim hair as he poses with my monthly marker. It's been a long day in the sun and heat so now it's time to relax and maybe laze in our pool. 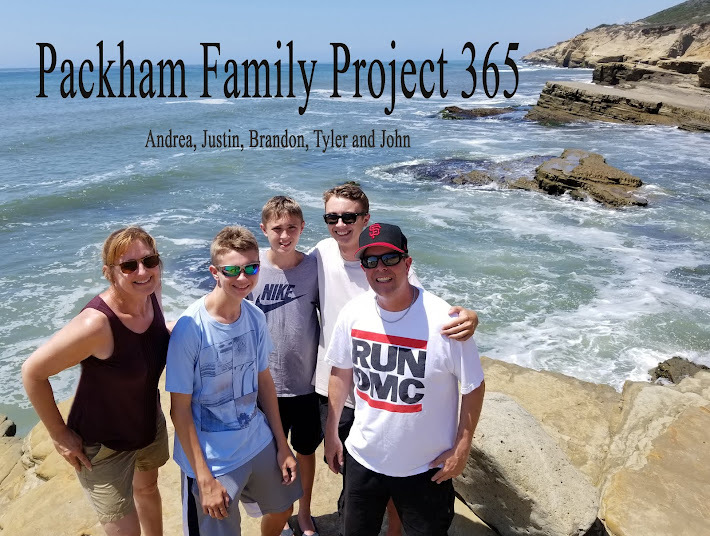 Brandon pulled together his last school project so he can present this week. He had to find 3 things that represent and important person in his life and these are the 3 things that represent his grandpa Shook (my dad)--an avocado because he grew up on an avocado farm, the hat he wore to fight forest fires working for the Forest Service, and an RV because in his retirement he travels the country working as a campground host. That's it. Looking forward to a week with no homework and the end of the school year. See you next Tuesday after our long weekend in the LA/San Diego area.